An anti-ship cruise missile (ASCM) developed by the U.S. Defense Advanced Research Projects Agency (DARPA) that "thinks" thanks to its onboard artificial intelligence (AI) will arm U.S. Navy warships and strike aircraft beginning 2019 and U.S. Air Force combat aircraft in 2018. The Long Range Anti-Ship Missile (LRASM) can find a warship target on its own by using its onboard AI to locate a specific warship from among a fleet of enemy warships. A multi-mode seeker guided by the AI ensures the correct warship is hit in a specific area to maximize the probability of sinking the target. The AI enables autonomous targeting by using on-board targeting systems to independently acquire a target without the need for prior precision intelligence, GPS or data-links. These capabilities allow positive target identification and the precision engagement of moving warships in an enemy fleet heavily defended by surface-to-air missiles (SAMs) and electronic countermeasures. The missile is designed with counter-countermeasures to evade active defense systems on enemy ships. 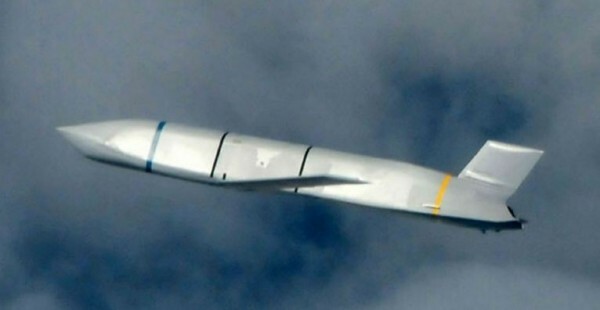 Built by Lockheed Martin, LRASM will be an effective counter to the capabilities of the People's Liberation Army Navy (PLAN) that relies on long-range anti-ship missiles (ASMs) and SAMs for its offensive and defensive power. Its warhead is a 450 kg blast-fragmentation penetrator. LRASM, which carries the identifier AGM-158C, can be launched at a target PLAN warship from as far away as 370 kilometers. That places the launching U.S. attack aircraft well out of the range of the Chinese HHQ-9 SAM defending many of the PLAN's modern warships. HHQ-9, the PLAN's most modern SAM, has a slant range of 200 km. More tellingly, multiple LRASMs can share data to coordinate an attack as a swarm. Enhancing the glide weapon's survivability is that it doesn't emit any signals that can be detected by the enemy. This advantage combined with a low-radar cross section airframe and a low infrared signature reduces the chance of detection. LRASM is compatible with the Mk 41 Vertical Launch System on many US Navy warships. It will also arm F/A-18E/F Super Hornets, which will be able to carry two missiles, and the F-35C Joint Strike Fighter (two LRASMs). A U.S. Air Force B-1 can carry up to 24 LRASMs. The B-2, B-52, F-15E Strike Eagle and F-16 will also be armed with the AI missile. DARPA and the Office of Naval Research collaborated on the LRASM program, which successfully launched its first prototype in August 2013. DARPA designed the free-flight transition test demonstration to verify the missile's flight characteristics and assess subsystem and sensor performance.